In her storied career as a Texas Ranger, Caitlin has confronted all manner of villains, but nothing that’s prepared her for the terrorist group ISIS’s pursuit of a devastating weapon on Lone Star State soil. The land in question lies on an Indian reservation where a drilling operation steeped in mystery and controversy is about to commence under the auspices of shadowy billionaire Cray Rawls. But Rawls is only one of Caitlin’s problems. Her surrogate son Dylan, the oldest boy of her reformed outlaw lover Cort Wesley Masters, has joined the tribe to protest Rawls’ desecration of the sacred Indian lands. The same desecration that has unearthed an ancient evil Caitlin’s own great-great-grandfather fought nearly 150 years before. There’s also a twisted genius who’s uncovered the true nature of that evil, a young man with whom Caitlin shares a past now poised to deliver Armageddon from Texas’ canyonlands. To save millions from a horrible fate at the hands of ISIS, Caitlin and Cort Wesley must sort through a web of death and deceit as tangled as the blood-soaked grounds of the reservation that hold a deadly secret. A secret that’s the source of a battle rooted in the past and now destined to determine the shape of the future. Strong Cold Dead is the first book Caitlin Strong book I have read, but I'm pretty sure it will not be my last. I'm actually quite sure about that since the first thing I did after finishing this book was ordering the first book. Lucky me that have seven unread Caitlin Strong books to read. So, what was it that got me so enthralled that I just had to buy myself the first book? When it comes to book so are some so good that I feel right from the start that this is a 5-star book. And, this one felt like that. And, not for a moment did I waver from that thought. Strong Cold Dead has several fascinated characters, and of course, Caitlin is one of them, but also just loved to read Caitlin's great-great-grandfather Steeldust Jack Strong's POV in the book, who like Caitlin was a Texas Ranger. I was fascinated with the mystery of what it was on the Indian reservation that was so special and what secret the people living there are hiding from the outside world. And, to top it all, suddenly we have ISIS also involved in the story. There is a lot of jumping between characters, but that never really bothered me and this is one book were both parallel storylines (the one in the present and the one 150 years before) were equally interesting to read. The addition of a mystery from the 1930s added some extra intrigue to the story. Strong Cold Dead was a fantastic book, well-written, and I've taken to my heart both Caitlin and Steeldust Jack Strong. They are so well-developed and fascinating that I just can't wait to read more about them. There is a lot of action, but also some very poignant moments. In short, this book has all the ingredients I love, humor, action, mystery, and tragedy. And, I wish to God that I had the first book right now! I'm even tempted to order book two in the series, I'm hooked! I want to thank Partners In Crime Virtual Book Tours for providing me with a free copy for an honest review! “Nobody goes beyond this point, ma’am,” the tall, burly San Antonio policeman, outfitted in full riot gear, told Caitlin Strong. Salazar looked at Caitlin, scowling as he backed away from her Explorer. A few blocks beyond the checkpoint, a grayish mist seemed to hover in the air, residue of the tear gas she expected would be unleashed again soon. That is, unless the youthful crowd currently packed into the small commercial district at the near end of Hackberry Avenue dispersed, which they were showing no signs of doing. The third night of trouble had brought the National Guard to the scene in full battle attire that included M4 rifles and flak jackets. Caitlin could see more floodlights had been brought in to keep the street bathed in day-glow brightness, casting a strange hue in the air that reminded her of movie kliegs, as if this were a scene concocted from fiction rather than one that had arisen out of random tragedy. Neighborhood watch leader Martinez, a lifelong resident of J Street who’d managed to steer clear of violence all his life, started firing his heirloom Springfield 1911 model .45 as soon as the gang bangers yanked pistols from the droopy waistbands of their trousers. The only thing his shots hit was a passing San Antonio police car, the uniformed officers inside mistaking the fire as the gang bangers’ and opened up on them so indiscriminately that the lone victim of their fire was a ten-year-old boy who’d emerged from the same convenience store. It was almost dawn before everything got sorted out and the investigative team comprised of San Antonio and Highway Patrol detectives thought they’d managed to get control of the situation. Then relatively peaceful protests by day gave way to an eruption of violence at night, spearheaded by rival gangs who abandoned their turf wars to join forces against an enemy both of them loathed. Violence and looting reined, only to get worse by the second night when eight officers ended up hospitalized, one from what was later identified as a bullet instead of a rock. And now the third night found the National Guard on the scene in force and armored police vehicles from as far away as Houston barricading the streets to basically shut off the neighborhoods of East San Antonio’s northern periphery from the rest of the city. “You’re still here, Ranger,” Sergeant Salazar noted. “On whose orders exactly?” Caitlin wondered. “Mine,” a female voice boomed, a moment before Caitlin heard a loud pop!, like a shotgun blast, crackle through the air. A few blocks beyond the checkpoint, one of the spotlights fizzled and died, victim of a well-thrown rock more likely than a bullet. Caitlin was out of her Explorer by then, hand instinctively straying to her holstered SIG Sauer P-225 in anticipation of more shots to follow. “Get back in your vehicle, Ranger,” said Consuelo Alonzo, deputy chief of the San Antonio police department, as she strode forward, red-faced from the exertion of rushing to the scene from the police line upon learning of Caitlin’s arrival. “You got a problem with getting some more back-up?” Caitlin asked her. Instead of settling down, Alonzo’s agitation continued to increase. Her face had grown redder, her words emerging through breaths becoming more and more rapid. She had risen quickly through the ranks of the department, becoming the youngest woman ever to make captain three years prior to her recent promotion to deputy chief. And she had been rumored to be in line for the job of Public Safety Commissioner that came with a plush Austin office and a job that would place her, among other things, as chief overseer of the Texas Rangers. Alonzo no doubt relished that particular perk of a job certain to be hers, until the death of a Chinese diplomat, exacerbated by Caitlin’s solving the murder while Alonzo was dealing with more politically oriented ramifications, led to her being passed over. Alonzo had overcome an appearance often referred to as “masculine” by even her supporters and much worse than that by her detractors, who seemed to put no stock in the fact that she was happily raising three young children with her husband who was a professional boxing referee. This was Texas, after all, where a woman needed to work twice as hard, and be twice as good, in a profession ruggedly and stubbornly perceived to be for men only. Caitlin and Alonzo had had their differences over the years, but had mostly maintained a mutual respect defined by their professionalism, and the sense that their own squabbles only further emboldened those who sought their demise. At least until Alonzo cast Caitlin with all the blame for her losing out on a job that was likely never going to be hers now. Since then, she’d used her position as deputy chief to wage subtle war on the Rangers’ San Antonio-based Company F whenever possible, seizing upon any bureaucratic conflict or jurisdictional dispute she could in a hapless attempt to make Caitlin’s life miserable. Alonzo ran a hand through her spiky hair. She was heavyset and had once set the woman’s record for the bench press in her weight class. She’d also done some boxing and was reputed to be the best target shooter with a pistol in the entire department. But Caitlin had beaten her three times running when they’d gone up against each other in state-sponsored contests, winning the overall title in two of those instead of just the woman’s division. She’d stop entering after her most recent victory, figuring the last thing she needed was to draw more attention to herself than her exploits already had. “You’re not moving, Ranger,” Alonzo told her. Caitlin skulked about the outskirts of the neighborhoods just outside the riot zone. Through windows not boarded up or covered in grates, she spied more than one family following the simmering violence just a few blocks away on their televisions while huddled against a wall. According to the information she’d obtained from a trio of informants, “Diablo” Alcantara was running the show from his sister’s home near J Street two blocks from the brewing riot’s front lines. The cartels had trained Alcantara well, taught him the tricks of their own trade to inspire everyday people to turn to violence to the point that it came to define them. A road a person was often too far down by the time he found himself on it at all. So it was here in East San Antonio, where closing the schools for the day had turned hundreds of teenagers into virtual anarchists, looting and destroying for its own sake. Right now Caitlin could still smell the smoke from a Laundromat that had burned to the ground when local firefighters and their trucks were chased back by crowds hurling bottles and rocks. Three had been hospitalized and one of the engines had been abandoned at the head of the street where it too had been set ablaze. The Laundromat had chemicals and detergents stored in a back room that turned the air noxious for a time, the strange combination of lavender soap powder mixing with the corrosive bleaches to form the perfect metaphor for the city of San Antonio. Watching those white curtains of mist wafting through the flames to chase the rioters away more effectively than any efforts the authorities had mounted, though, had given Caitlin the idea to which Deputy Chief Alonzo had refused to listen. Holding her position against a house in view of the main drag, Caitlin checked her watch, then the sky, and finally her cell phone to make sure she had a strong signal. Since word was the gangs were communicating via text message, there was talk of shutting down the grid, lasting until nobody could figure out a way to do it quickly—something she was glad for now. Above the fire smoke and tear gas residue staining the air in patches, the night sky was clear and she made out a bevy of news choppers with navigation lights flashing like the stars millions of miles beyond them. Creeping closer to J Street and the home of Diablo Alcantara’s sister, Caitlin froze just beyond the spray of a streetlight showcasing a block packed with gang members proudly and openly displaying their colors. Amid the gang bangers unified in this unholy alliance, she spotted a stocky figure more bulk than muscle holding court near the rear. Diablo Alcantara had gotten into a knife fight while in high school and ended up losing an eye to a slice that split the left side of his face right down the middle. Even in pictures, it was hard to look at the jagged scar and translucent orb visible through the narrow slit Alcantara had for a socket without feeling a flutter in her stomach from the sight. Caitlin knew the stocky figure was Alcantara the moment he turned enough toward the streetlight for its spray to reflect off the marble-like thing wedged into his skull in place of an eye. She counted fifty bangers in the vicinity armed with assault rifles and submachine guns no intelligence report had made mention of, meaning such firepower must’ve only just reached the scene courtesy the cartels. Caitlin figured she had three, maybe four minutes to wait, spending the first of them following the gang members’ antics in preparation for what was to come. Some of them wore military-grade flak jackets, in odd counterpoint to the pungent scent of marijuana smoke gradually claiming the air. She watched beer bottles drained and smashed, a few stray shots fired into the air to cheering by the most chemically altered in the bunch. Caitlin checked her watch one last time before she stepped out from the darkness onto the street, light glinting off her badge and holstered pistol in plain view, as she continued toward the center of the block. Jon Land is the USA Today bestselling author of 38 novels, including eight titles in the critically acclaimed Caitlin Strong series: Strong Enough to Die, Strong Justice, Strong at the Break, Strong Vengeance, Strong Rain Falling (winner of the 2014 International Book Award and 2013 USA Best Book Award for Mystery-Suspense), Strong Darkness (winner of the 2014 USA Books Best Book Award and the 2015 International Book Award for Thriller and Strong Light of Day which won the 2016 International Book Award for Best Thriller-Adventure, the 2015 Books and Author Award for Best Mystery Thriller, and the 2016 Beverly Hills Book Award for Best Mystery. The latest title in the series is Strong Cold Dead, to be published on October 4 and about which Strand Magazine said is “certain to rank Land among a handful of our most talented thriller authors of this decade.” Land has also teamed with multiple New York Times bestselling author Heather Graham on a new sci-fi series, the first of which, The Rising, will be published by Forge in January of 2017. He is a 1979 graduate of Brown University and lives in Providence, Rhode Island. 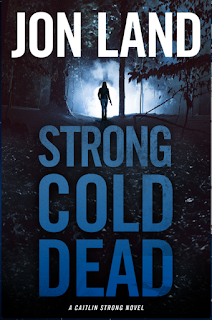 This is a rafflecopter giveaway hosted by Partners In Crime Virtual Book Tours for Jon Land to celebrate the release of his 8th Caitlin Strong thriller, Strong Cold Dead. 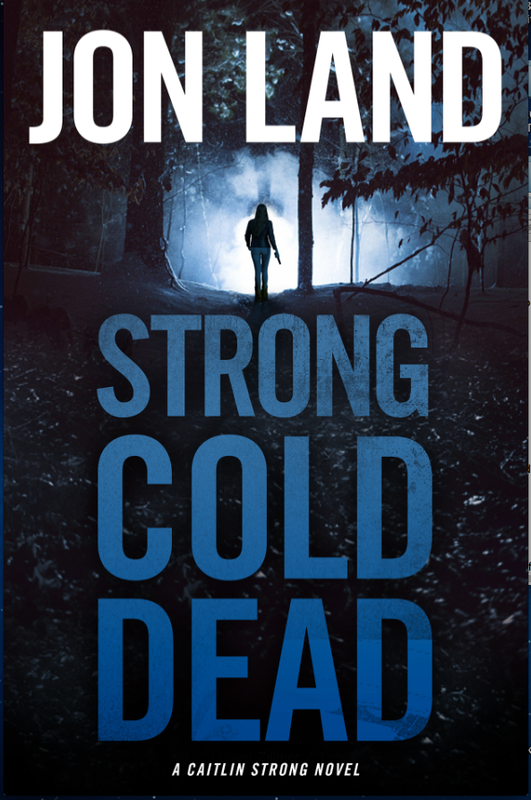 There will be 5 winners of one (1) autographed copy of Strong Cold Dead by Jon Land. This giveaway is limited to US & Canadian residents only. The giveaway begins on September 28th and runs through November 3rd, 2016. I'm with you! This was the first book I read by this author and can't wait to get my hands on all the previous books in this series!! And I want to thank you for just a fantastic review! It always means so much to me to hear such wonderful words, especially from a reviewer who's never read me before and especially because not being familiar with the previous entries in the series didn't hamper your enjoyment at all. This actually the 8th in the Caitlin Strong series, to be followed by STRONG TO THE BONE around this time next year. Can't wait to hear what you think of that one and you can reach me directly at jonlandauthor@aol.com. A Bookaholic Swede was created 2015-04-25, before that did Magdalena run a book blog called "And Now For Something Completely Different", but the title was a bit too long. But, she did start blogging back in 2014 with the site It's a Mad Mad World, the blog is still up, but less updated nowadays. Share book reviews and ratings with Magdalena, and even join a book club on Goodreads.